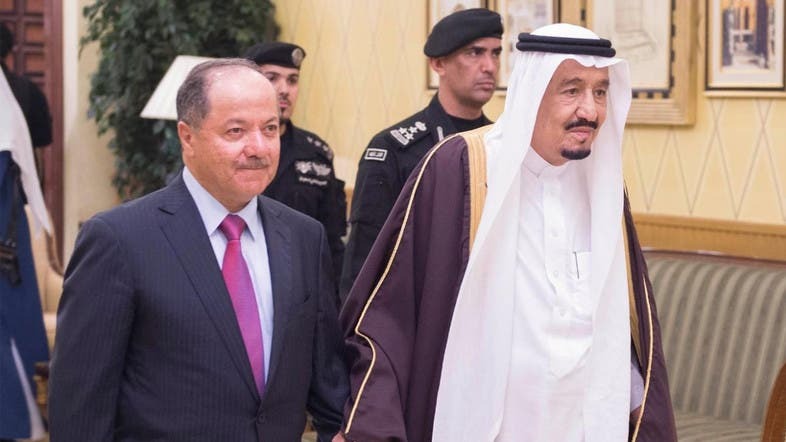 Saudi Arabia’s King Salman received Kurdistan Region of Iraq (KRG)’s President Massoud Barzani in Riyadh for talks on enhancing bilateral ties. Both leaders discussed different strategies for further cooperation between Saudi Arabia and Iraq, in addition to issues of mutual concern. The reception was attended by Crown Prince Muhammad Bin Naif, deputy premier and minister of interior, Deputy Crown Prince Muhammad Bin Salman, second deputy premier and minister of defense, Prince Muqrin, Prince Miteb Bin Abdullah, minister of the National Guard, Riyadh Emir Prince Faisal Bin Bandar, Ibrahim Al-Assaf, minister of finance, Adel Al-Jubeir, minister of foreign affairs, Adel Al-Turaifi, minister of culture and information, and other princes and officials.